Every blog platform like Blogger and WordPress support RSS Feeds by default. You can manipulate RSS Feed in many forms to distribute and share your blog’s content more easily among reader. Email has been most common form of communication and lot of people still use email regularly. Do you want to distribute your blog content through regular email newsletters to your subscribers? This is can easily done using power of RSS with RSS feed to Email Newsletter transformation. Following are few free and premium services for sending regular (daily) email newsletters to your subscribers. 1. Feedburner (completely Free) – It is only Free newsletter service that actually works and it easy to use. 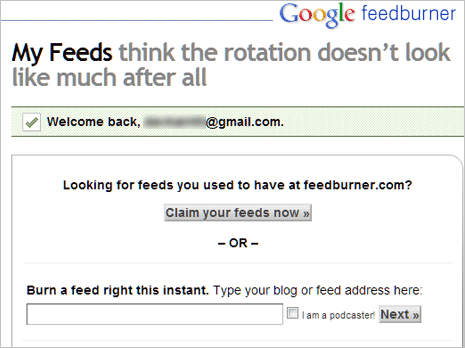 Feedburner (now owned by Google) allows you to setup multiple RSS feeds in the account. To get started, you can use your existing Gmail or Google Account to login. Then enter RSS feed url of your blog to get going (For WordPress blogs, the default RSS feed url is example.com/feed/ – where example.com is your blog name). You need to activate Email susbcription option from Publicize tab within your Feedburner account. Overall it is an effective service that is completely free and great for beginners. 2. FeedBlitz (Free 30 days trial) – FeedBlitz is marketed as better alternative to free “Feedburner” service. It does offer lot more features for sending email newsletters to subscribers. It provides more reliable back-end for timely delivery of email messages. With all the goodness, there is a charge for the usage. You need to pay monthly amount according to number of active email subscribers, rest everthing is unlimited. Ideal for beginners on tight budget. 3. Norish (Free upto 1000 emails per month) – Nourish is another service that allows you to generate and send email newsletters to website subscribers. It provides reasonable Free plan to get going, which can be upgraded later for more features. In free plan you can setup one campaign and send upto 1000 emails per month. It also includes features like: combining multiple RSS Feeds, flexible scheduling along with nourish branding. 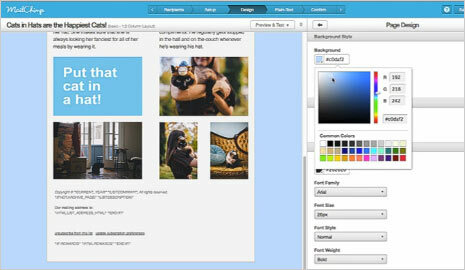 Pro plans have custom templates without nourish branding. Another option beginners can explore without splurging too much. 4. Subscribe2 plugin (only basic version Free) – WordPress users can install Subscribe2 email subscription plugin. It is a free plugin for subscription management within WordPress. It allows you to sends email notifications to a list of subscribers when you publish new content on your blog. Free version can only send plain text email messages. For HTML formatted email messages you need to register and subscribe to the paid plan. Handy plugin, if you only use WordPress to create online content. 5. MailChimp (professional service with Free option) – MailChimp is very popular service among top bloggers for sending email newsletters. It comes with very attractive free plan that allows you to send 12,000 emails for upto 2,000 subscribers along with designer templates support. There are lot of additional support features that allows quick and easy integration of MailChimp with your current website or blog. It provide comprehensive approch to: design, publish, share, track, manage, integrate and mobile support. Great professional looking option for intermediate and advance bloggers. 6. Aweber (professional but no free option) – Aweber is a close competitor of MailChimp and offer lot of features. It provides robuts service to send professional looking elegant email newsletters to your website subscribers. You can easily integrate with social platforms like Facebook and Twitter using Aweber service. Once you have sent emails, you can analyse results by tracking everything like who opened your email newsletter. It also automatically publish email newsletters online so your subscribers can browse past emails and share your content with others. Great professional option with a price tag. Techno People, How does your work place look like?